Background: Cutaneous thin melanoma (defined as ≤ 1.0 mm in depth) is typically treated by wide excision alone with sentinel node biopsy (SLNB) for melanomas >0.75 mm. In some cases, the final surgical pathology may identify a thicker primary than noted on initial biopsy. We sought to assess the impact of additional biopsy of residual pigment and its role in changing surgical management of the primary tumor. Methods: All patients with residual pigment after a diagnosis of atypical melanocytic proliferation (AMP), melanoma in-situ (MMIS), or invasive melanoma ≤0.75mm who underwent additional biopsy prior to definitive resection were reviewed. Clinico-pathologic outcomes were reviewed. Results: Seventy-five patients were identified who met the search criteria. Fifty patients (66.7%) presented with a thin melanoma on initial biopsy and twenty-five patients (33.3%) presented with either AMP or MMIS on initial biopsy. The mean age of patients was 62.6 years old (51% male). The median number of additional biopsies was one. Initial biopsies were most commonly performed as a shave biopsy (62.7%) whereas re-biopsies were most commonly performed as a punch biopsy (86.7%). Primary melanomas were most commonly found on the extremities (62.78%), followed by the trunk (26.7%) and head and neck (10.7%). Of the seventy-five total patients with a melanoma ≤ 0.75mm on initial biopsy, twelve patients (16%) had a final depth >0.75mm on re-biopsy and subsequently underwent SLNB at the time of wide excision. One of these patients (1.3%) had a positive node identified on SLNB. Six patients (8.0%) had a change in surgical margins during wide excision due to re-biopsy upstaging the AMP, MMIS or melanoma. Five of these patients (6.7%) were identified as either AMP or MMIS on initial biopsy and on re-biopsy had thin melanomas. Seventy-three patients (97.3%) did not demonstrate a greater depth on final pathology as compared to preoperative biopsy. Summary: Re-biopsy of pre-malignant and thin melanoma can impact both the decision to perform a SLNB as well as the extent of surgical margins. 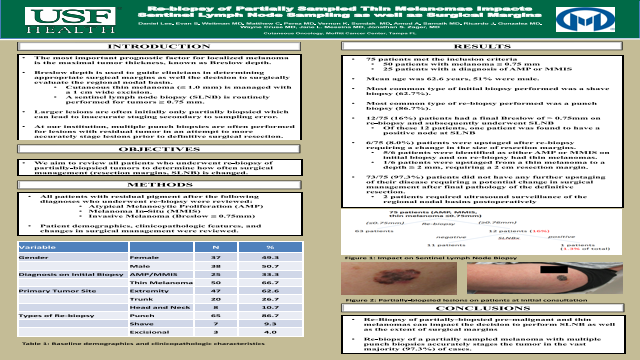 Additionally, re-biopsy of a partially-sampled melanoma is a strong indicator of final tumor depth and a quick, easy and accurate way to identify upstaging for partially sampled melanomas.References: Zager, J.S., Hochwald, S.N., Marzban, S.S., Francois, R., Law, K.M., Davis, A.H., Messina, J.L., Vincek, V., Mitchell, C., Church, A., Copeland, E.M., Sondak, & V.K., Grobmyer, S.R. (2011). Shave Biopsy Is a Safe and Accurate Method for the Initial Evaluation of Melanoma. Journal of the American College of Surgeons, 212(4), pp 454 – 462. Doepker, M.P., & Sarnaik, A.A., (2016). Surgical Treatment of Melanoma. In J.S. Zager, R.R. Kudchandkar, & V.K. Sondak (Eds. ), Melanoma (pp. 55 – 63). New York, NY: Oxford University Press. Yamamoto, M., & Zager, J.S. (2016). Biopsy Techniques for Melanoma. In J.S. Zager, R.R. Kudchadkar, & V.K. Sondak (Eds. ), Melanoma (pp. 31 – 39). New York, NY: Oxford University Press.